May 31 - Jun 2 2000th Run Weekend Hosted by the Edinburgh H3 in Edinburgh, Scotland. May 31 - Jun 2 Pan Africa Hash Hosted by the Freetown H3 in Freetown, Sierra Leone. 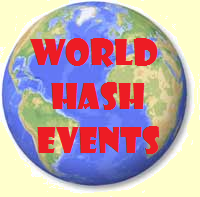 May 31 - Jun 2 2000th Hash Weekend Hosted by the Vindobona H3 in Horitschon, Southern Burgenland, Austria. May 31 - Jun 2 Beerfest Hosted by the Pittsburgh H3 in Tarentum, PA, USA. May 31 - Jun 2 Campout Hosted by the Kansas City H3 in McLouth, KS, USA. Jun 6-9 Red Dress Run Hosted by the Waukesha H3 in Waukesha, WI, USA. Jun 7-9 Campout Weekend at the Woods Hosted by the Lehigh Valley H3 in Lehighton, PA, USA. Jun 14-16 7th Anniversary Hosted by the Manchester H3 in Oldham, UK. Jun 15-22 8th Dalmatian Hash Cruise Hosted by the Dalmatian H3 sailing from Split, Croatia. Jun 21-23 Southern Exposure Hosted by the Wandering Soul H3 in Cleveland, OH, USA. Jun 21-23 Suns Out! Buns Out! Hosted by the Ventura County H3 and others in Los Padres National Forest, CA, USA. Jun 21-23 Backcountry Glamp-out Hosted by the Palmetto H3 in Wagener, SC, USA. Jun 26-30 Great Alaska Interhash Hosted by the many hash clubs of Alaska in Anchorage, AK, USA.